Saint David (c. 500 to 589) (Welsh: Dewi Sant) was a church official; he was later regarded as a saint and as the patron saint of Wales. David is a native of the country of which he is patron saint, and a relatively large amount of information is known about his life. However, his birth date is still uncertain, as suggestions range from 462 to 512. St David's Day is celebrated in Wales on 1 March, in honour of Dewi Sant or St David, the patron saint of Wales. Little is known about him for certain. What little information we have is based on an account of his life written by Rhigyfarch towards the end of the 11th century. According to this Latin manuscript, Dewi died in the year 589. His mother was called Non, and his father, Sant, was the son of Ceredig, King of Ceredigion. After being educated in Cardiganshire, he went on pilgrimage through south Wales and the west of England, where it is said that he founded religious centres such as Glastonbury and Croyland. He even went on a pilgrimage to Jerusalem, where he was made archbishop. He eventually settled at Glyn Rhosyn (St David's), in south-west Wales, where he established a very strict ascetic religious community. Many miracles have been attributed to him, the most incredible of which was performed when he was preaching at the Synod of Llanddewibrefi - he caused the ground to rise underneath him so that he could be seen and heard by all. How much truth is in this account of his life by Rhigyfarch is hard to tell. It must be considered that Rhigyfarch was the son of the Bishop of St David's, and that the Life was written as propaganda to establish Dewi's superiority and defend the bishopric from being taken over by Canterbury and the Normans. From the 12th century onwards, Dewi's fame spread throughout South Wales and as far as Ireland and Brittany. St David's Cathedral became a popular centre of pilgrimage, particularly after Dewi was officially recognised as a Catholic saint in 1120. From this period on, he was frequently referred to in the work of medieval Welsh poets such as Iolo Goch and Lewys Glyn Cothi. In 1398, it was ordained that his feast-day was to be kept by every church in the Province of Canterbury. Though the feast of Dewi as a religious festival came to an end with the Protestant Reformation in the 16th century, the day of his birth became a national festival during the18th century. Now March 1 is celebrated by schools and cultural societies throughout Wales. It is the custom on that day to wear either a leek or a daffodil - two of our national emblems - and for young girls to wear the national costume. Have you seen our NEW St David's Greeting card? Take a look at this wonderful card, beautifully designed and with the history of St. David included, as well as prayers and a special greeting. 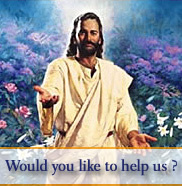 A unique St David's greeting card for your family and friends. 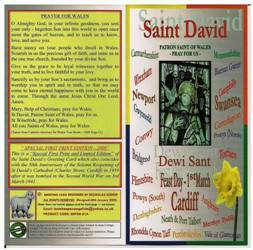 Indeed, it's more than a greeting card, includes the history of St David and Prayers.